‘Spelunky’ holds a very special place in my memory for being the first true indie game I’ve ever played. I first played the game back when the free version of the game was circling the internet (Note: The legitimately free version, not a pirated copy) and I loved everything about it, from its brilliant difficulty balance to its excellent platforming and puzzles. Unfortunately, as a result of the free version being discontinued and my old computer dying, I never actually finished the game, only making it as far as the third level. So when I got myself the full HD version of the game last week, I vowed that I would not rest until I saw that game through to the end. As of this review, I have not yet succeeded, but certainly not for a lack of trying. “Spelunky” is a puzzle-platformer created by Derek Yu that stars The Spelunker, an Indiana Jones knock-off whose quest is to explore a labyrinthine series of mines fabled to obtain unimaginable wealth and danger. The player’s ultimate goal is to guide him (or her) through the four different areas of the mines (each containing 4 individual levels) in order to reach the bottom and obtain the ultimate treasure. While this initially seems to be an easy feat, as each level only lasts about 2 to 3 minutes, the catch is that if you die at any point in the game, you lose all the treasure you’ve collected thus far and you must start over from the beginning. On top of that, every level of the game is randomly generated, meaning that reaching the bottom of the mines requires just as much luck as it does skill. What I love most about the game is that, even though every level is randomly generated, the levels themselves are still very well-designed. No matter what obstacles are placed in your way in each area, there’s always some means of progressing forward provided to you with just enough challenge to make following that path rewarding. In the few times where that isn’t the case, the Spelunker comes equipped with rope for climbing down or up large chasms and bombs for breaking down walls and creating your own way forward (at your own peril), which usually serve to negate glitches in the level creator. As a result, the game always feels difficult and demanding but rarely feels unfair, as it never breaks any of the rules it establishes in any of its various levels. Another perk of the level randomizer is the variety in levels that are created and the diverse situations you can be placed in within each run. One time through a level, you may stumble across a hidden treasure surrounded by traps, while the next playthrough may bring you to a shopkeeper selling extra supplies you desperately need. If you’re lucky enough, you may even stumble upon bonus areas, such as an undead graveyard or a deadly beehive (those bees still give me nightmares), each with their own unique treasures open to those crazy enough to go for them. This consistent presentation of new challenges to overcome and new tools for overcoming them keeps the gameplay consistently fresh, keeping the game continually surprising and intriguing. Graphically the game looks fairly standard. Since every area of the game is constantly subject to change, “Spelunky” takes the “Minecraft” route for its graphics, keeping the design of everything charmingly simple. Character designs have plenty of personality to them and every new area of the game looks distinct while keeping with the game’s general theme, making the game feel uniform. While honestly I can’t see anyone giving this game any awards for its graphics, as someone who played the original free version, which had NES-worthy graphics, I can say that I was pleasantly surprised. Same goes for the soundtrack which never got annoying even with only seven or eight songs practically played on repeat. 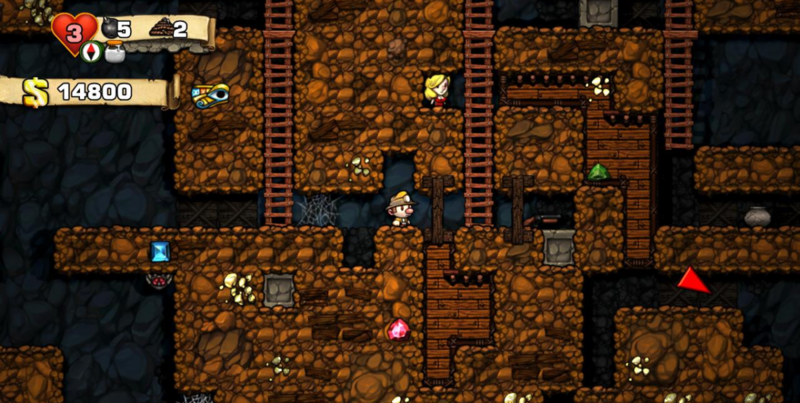 When it comes down to it, “Spelunky” is not the type of game for everyone. It is an incredibly demanding game that, in my opinion, surpasses the infamous “Dark Souls” in overall difficulty, making it almost poisonous to the weak-willed. But those who are willing to accept the challenge will find a fairly meaty game here that will last them for countless hours. It’s not a perfect game by any means, but it’s certainly a game that’s worth your time. Now if you’ll excuse me, I have a Yeti I need to get even with. Spelunky is available on PC, Mac, Xbox 360, PS3, and PS4 for $15. Also, as of the time of this review, the free version of “Spelunky” is available on PC for those who want to give the game a try, though that does come with a graphics and content downgrade.